Neil Gaiman's Journal: A gallimaufry. Last year, the daughter of the winner of the Moth auction of "afternoon tea with Neil Gaiman" met me for afternoon tea, and it all went a bit wrong. The winner was the mother of a very nice young lady, and she had paid $4,400 for her daughter to have tea with me (all the money goes to support The Moth, which is something I love and care about: people telling true stories about their lives. Check out their podcast). Unfortunately, when the nice young lady and I went to the tea place they explained that they'd never heard of us, and for that matter they didn't even serve tea, and it all went so wrong that I took the young lady in question up to DC Comics (she had told me that she loved comics, Vertigo in particular, and wanted to edit comics when she graduated) and then DC Publisher Paul Levitz, who was passing by, gave her an hour's masterclass in matters editorial and said something about a summer internship. I saw her at the signing for the Year's Best American Comics last month and the young lady told me that she'd just done a summer's internship at DC Comics, and loved it, and that the failed tea had been a wonderful thing better than any actual tea could possibly have been, and she was incredibly happy and grateful.. I cannot guarantee you that the afternoon tea with me this year will go anywhere nearly as wrong as that. But the Moth are at it again. Also, you could be an "area man or woman" in the Onion. I don't do much journalism any more, and I do even less book reviewing (I think the last book I reviewed was the Annotated Grimm's Fairytales for the New York Times, six years ago), but if I'm not reviewing at all I feel guilty, as if I am no longer being part of the cultural dialogue, so I just reviewed Stephen King's Full Dark, No Stars for the Guardian: http://www.guardian.co.uk/books/2010/nov/05/full-dark-stephen-king-review. I'm happy to say that I liked it. I turn fifty on Wednesday. Ivy Ratafia gets in there early, with a birthday LJ post for me. And I am putting it up here because Ivy answers one of the great questions of the universe here, viz. Which were the nine true panels in this two-page comic? In 17 years, no-one has been able to guess it correctly. You should probably read the comic first before you read Ivy's explanation. It comes from a 1993 "Roast" comic done for the Chicago Comic Convention, and was drawn by Scott McCloud and written by Scott and Ivy. I really don't do much journalism, and I'm amused to see that the only pieces I've done in so long are both being published-on-the-web on the same day. Since I typed that first paragraph, SPIN MAGAZINE just posted an article I wrote for them yesterday. They asked me to review the Dresden Dolls Hallowe'en show. People like it, and I'm glad that they do. And finally, All Hallow's Read appears, at least anecdotally, to have been a huge success. It's not too early to start thinking about what we ought to do next year. The website is up at http://www.allhallowsread.com/ - it's primitive, as it was thrown up in hours two days before Hallowe'en. I'd love to crowdsource this more - what kinds of things would people like to see on the website? What kinds of things would you like to see in real life? Posters? Suggestions? Should we enlist bookshops or publishers or libraries or all of the above? Should we start an online group? And what did you do (or give, or receive) for All Hallows Read this year that you'd like to pass on to the world? Use the "Leave a reply" form at the bottom of any of the AHR website pages. We'll start to plan next year's give-a-scary-book festival together. Right. Now I'm off to the (very small) bonfire. 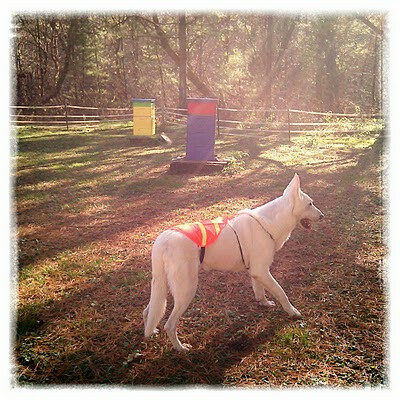 Here's a photo of Cabal today, when we went down to winterise the beehives.